The 21st Opus prizes ceremony took place this Sunday at « Salle Bourgie ». 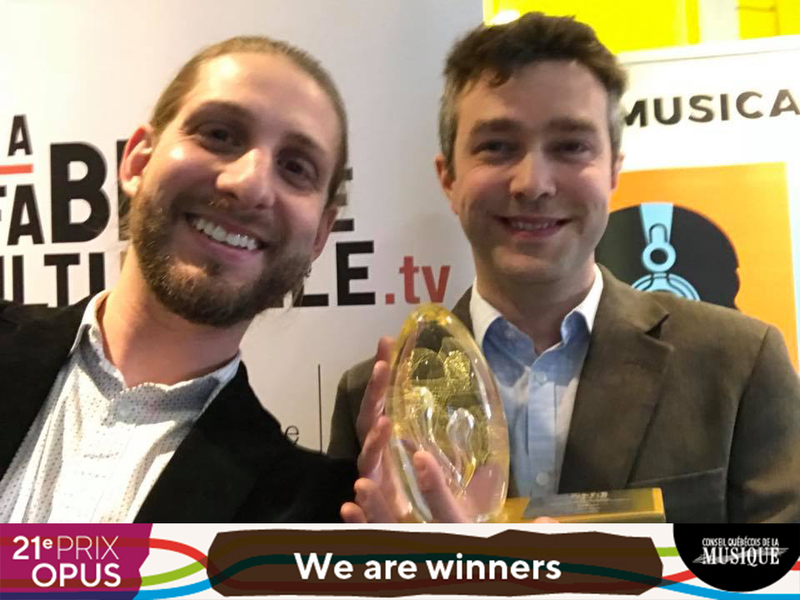 And Video Phase won his very first Opus prize with Lumens, concert of the year « musique actuelle et électroacoustique ». The Opus prizes, hosted by the « Conseil Québécois de la Musique », reward each year best productions for classical music, contemporary music, jazz and world music. We would like to warmly thank the CQM and the members of the jury for their votes. We want to thank the “Réseau Accès Culture” for believing in us and for giving us residencies, a hardly important element for the Lumens creation process. We also want to say “thank you” to the “Conseil des Arts de Montreal” for supporting us since the beginning, the “Conseil des Arts et Lettres du Québec” for supporting the “premiere” at the S.A.T., the “Mécènes Investis pour les Arts” and our IndieGogo donators. And of course, a huge “thank you” to the artists and creators who collaborated to Lumens creation. We have a sincere thought for Jean Derome, DAME and Supermusique, the other finalists in our category. They would also deserve the prize and recognition. If you want to know about all the winners of this 21st cereomy click here. Video Phase, creators of multi-sensory experiences combining music, video and technology. A show to hear with your own eyes.